Ravaglioli’s TD860T Fastliner Mobile Truck Aligner is the industry’s most productive and profitable system to date. Perfect for both in-shop and mobile on-site use, this machine is the answer to portability. Whether you are one the road or in the shop, the military grade storage cases make this a cinch to transport to the next job site – a fleet service techs dream. Paperwork is a part of life, and with the ability to store each and every alignment on the system hard drive, the TD860T is fully equipped to provide detailed, important documentation not only for your reference but for your customers peace of mind. Like other RAV aligners, this model features FastClamp Adaptors for no runout performance and can be remotely controlled by a smartphone – no more pushing, rolling or raising anymore. Nothing happens until the sale is made and the new FastCheck system is a proven way to increase your alignment sales and profits. We all know how effective documentation can be and the FastCheck provides documented evidence that alignment correction is needed. The FastCheck system allows you to check the alignment condition of the steering axle of every vehicle that comes to your service center. Within 3 minutes you will have the EZ Printout clearly indicating the alignment condition of the vehicle. Crooked tires on the printout are powerful proof that alignment attention is needed. The EZ Printout can be carried to a waiting customer….emailed to the customer’s home office….or emailed to your front counter or service counter. All this is accomplished from your smartphone or tablet! Our real world data indicates that approximately 60% of all vehicles FastChecked are found to require alignment adjustment. Furthermore our data indicates that sales are made 50% of the time. This means that about 1/3 of the vehicles that you FastCheck result in a successful sale of an alignment service. Since HD alignment services are one of the most lucrative services you could ever offer in your workshop, profits can be very significant. Do you wish you could sell more alignment services? We all know how important documentation has become in everyday business. RAV systems document each and every alignment so you do not have to. Alignment printouts and calibration reports are stored on the system hard drive for future retrieval if the need arises. Short on available space?…The FastCheck does not require a dedicated bay or service drive through lane. How portable is the FastCheck?… Move the FastCheck from bay to bay….take the system to the vehicle where it sits. It is not necessary to drive the vehicle to a different location in order to make the alignment test. Is the FastCheck truly fast? Yes, typically the alignment test can be completed in less than 2 minutes real time. Will the alignment test match the results when the car is moved to the alignment rack?… The FastCheck provides repeatable accuracy and lends integrity to your program. Unlevel floor?…The FastCheck is the only system that evaluates surface condition and compensates for an unlevel floor or rack. Will I be required to roll or push the vehicle in order to check the alignment…NO…The FastCheck does not require the vehicle to be rolled, pushed, or raised. portable trolley does not have to be near the vehicle being tested...part it anywhere in shop. The system will communicate wirelessly thru Bluetooth transmitting data from the heads to the console. Each vehicle that comes to your workshop for service gets a FastCheck test of its steer axle alignment condition. The FastCheck test requires 2-3 minutes in REAL TIME. The highly portable system is operated by Smart Tablet and its components use Bluetooth technology. It is not necessary to roll a console around the shop. Take the measuring components and the tablet to wherever the vehicle happens to be….in any bay….even on the parking lot! Send the EZ Printout from the tablet to the printer….to any computer in the building….even send it to your customer’s email address for their authorization. Present the EZ Printout to the customer as documented evidence that alignment correction is required. Using the graphical evidence of the printout as your basis explain the benefits of proper alignment and the consequences if the alignment is not done.Close the Sale! The more vehicles you FastCheck the more alignments you sell. The FastCheck system can also be used to adjust the steering axle toe angle. It is also easily upgraded to a complete alignment system anytime in the future! Want to increase alignment sales….tire sales…..sales of related parts and labor? Start FastChecking! SmartPhone operation allows you to remotely control the system from the palm of your hand. No need to roll a cabinet or trolley through congested bays to get to the vehicle. No rolling, pushing, or raising of the vehicle required. EZ Printout is powerful sales tool and can be printed or even emailed to your customer from the SmartPhone. EZ Printout is a graphically based document providing actual alignment test results. 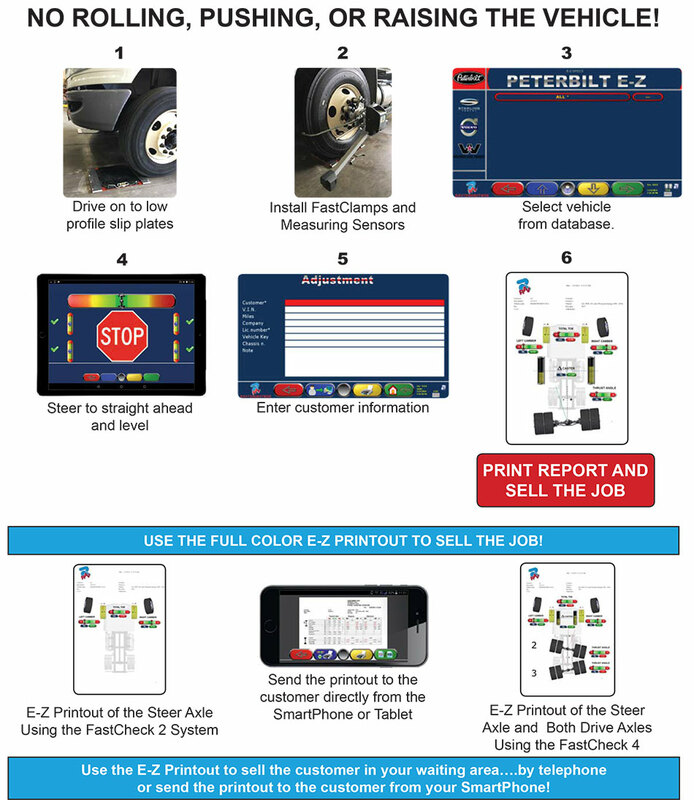 The EZ Printout can be printed for a hard copy….sent to your sales counter for presenting to the customer…or emailed to the customer from the SmartPhone. Can be used in any bay or floor…can be used with more than one lift. No towers…this system is absolutely tower free.